Join an explorer on a quest to discover hidden Inca treasure in Ecuador Gold. This 6 reel video slot from ELK Studios is played using a symbol drop game engine where successive wins can boost the number of ways to win from 4,096 right up to 262,144! Look out too for colossal symbols, ghosting wilds and a bonus round that awards up to 50 free games. Play on your PC, tablet or mobile from between 20p and £100 per spin. The interior of a jungle pyramid is the setting here. The symbols appear on stone blocks and drop onto the reels rather than spin. On those blocks you’ll see an assortment of primitive shapes and animals. They’re joined by 3 higher value gold masks and the intrepid explorer who is the top payer. Land 3, 4, 5 or 6 of him on adjacent reels and you’ll win a payout equal to 1.8, 2, 2.5 or 3 times your bet. Not the biggest award we grant you. Symbols can appear in 2×2, 3×3 and 4×4 blocks as well as singles – this is called the Big Symbols feature. There’s also a standard wild that replaces everything bar the bonus. Also helping your chances are ghosting wilds that can appear on reels 3, 4, 5 and 6 only. These leave trails of wilds when they hit. The symbol drop game engine, called the Avalanche feature, means that successful symbols are removed following a winning spin. An extra row is also added for that next symbol drop, boosting the number of ways to win. If the reels reach their maximum height of 8 rows, you’ll be playing on reels that offer 262,144 ways to create a winner! The main attraction in Ecuador Gold is the Free Drops Bonus feature which is triggered in the usual manner by landing 3 or more bonus symbols on the same spin. Land 3, 4, 5 or 6 of them and you’ll receive 10, 15, 20 or 25 free drops/spins. The symbol drops, complete with expanding reels are in play during the feature. Unlike the base game, they don’t revert back to their original size following a winless drop. They either stay the same or increase. Once again, the number of ways to win can reach over 262,144 ways. Re-triggers are possible too meaning up to 50 free spins/drops are possible. This central American trek isn’t bad. The design isn’t quite as slick as you’ll see in some video slots but it’s clear enough. The actions ticks along at a steady pace thanks to the symbol drop game engine. In fact, what you make of Ecuador Gold will largely come down to whether you’re a fan of this type of video slot. If you do enjoy symbol drop games, then this ticks most of the boxes. 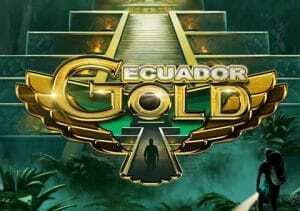 With potential payouts of up to 2,500 times your bet on each spin/free spin, Ecuador Gold can live up to its name too if the Inca gods are smiling. I would also recommend ELK Studios’ Valkyrie which is still my favourite video slot of theirs.